Lawyer Mudrakat Alabi Macfoy arrives at Lagos Polo Club during the 2019 Lagos International Polo Tournament, Nigeria, March 16, 2019. "Polo has shifted from just the sports to a fashion statement," said Mudrakat Alabi-Macfoy, wearing an airy white kaftan with a multi-colored floral necklace and head wrap at the Lagos Polo Club. "For me it is something fun, something playful, something whimsical, something comfortable... a bit of color, a bit of pop," said Alabi-Macfoy, who works as a lawyer when not watching polo. In a nation with the world's highest number of people in extreme poverty, the often-dubbed "sport of kings" is prohibitively expensive for the majority. 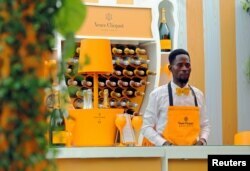 A bartender stands at a Veuve Clicquot champagne bar during the 2019 Lagos International Polo Tournament in Lagos, Nigeria, March 16, 2019. "It is an expensive sport because, you know, your horses are like babies," said Koyinsola Owoeye, who has been playing polo since 2007, seduced by his father's love of the sport. "Maintenance is not easy. Today they can be well, tomorrow they can have, you know, malaria, fever, colic, or even get injured on the field or on their way to the tournament," Owoeye said.